A miniature model of the Stena Line ferry on display at Madurodam miniature park, the Netherlands. Stena Line was founded in 1962 by Sten A. Olsson in Gothenburg, Sweden, which still serves as the company's headquarters, when he acquired Skagenlinjen between Gothenburg and Fredrikshavn, Denmark. In 1972, Stena Line was one of the first ferry operators in Europe to introduce a computer-based reservation system for the travel business area. In 1978, the freight business area also started operating a computer-based reservation system. The first freight-only route started between Gothenburg, Sweden and Kiel, Germany. The ship was the MS Stena Transporter. During the 1980s, Stena acquired three other ferry companies. In 1981, Sessan Line, Stena's biggest competitor on Sweden–Denmark routes, was acquired and incorporated into Stena Line. This included Sessan's two large newbuilds, Kronprinsessan Victoria and Prinsessan Birgitta, which became the largest ships operated by Stena by that date. In 1983, Stena acquired Varberg-Grenå Linjen, and two years later also the right to that company's former name, Lion Ferry. Lion Ferry continued as a separate marketing company until 1997, when it was incorporated into Stena Line. In 1989, Stena acquired yet another ferry company, Stoomvaart Maatschappij Zeeland (SMZ) (which at the time traded under the name Crown Line). SMZ's Hoek van Holland–Harwich route then became a part of Stena Line. Stena Line doubled in size in 1990 with the acquisition of Sealink British Ferries from Sea Containers. 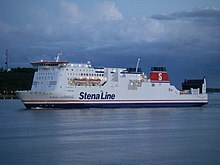 This first became Sealink Stena Line, then Stena Sealink Line and finally Stena Line (UK), which now operates all of Stena's ferry services between Great Britain and Ireland. In 1996, Stena Line introduced its 20,000 tonne HSS (High-speed Sea Service) vessels, which operated from Belfast to Stranraer, Holyhead to Dún Laoghaire and Hoek van Holland to Harwich. In addition to the three 1,500-passenger HSS vessels, Stena Line ordered two smaller 900-passenger HSS vessels to operate on the Gothenburg–Frederikshavn route. Due to the bankruptcy of the shipyard, only the first of these vessels was ever completed. In 1998, Stena's operations from Dover and Newhaven were merged with P&O European Ferries to form P&O Stena Line, 40% of which was owned by Stena and 60% by P&O. 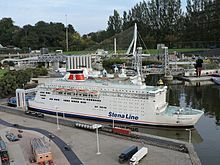 In 2002, P&O acquired all of Stena's shares in the company, thus becoming the sole owner of P&O Stena Line, which soon changed its name to P&O Ferries. In 2000, Stena Line purchased yet another Scandinavian ferry operator: Scandlines AB. In November 2006, Stena ordered a pair of "super ferries" with a gross tonnage of 62,000 from Aker Yards, Germany for delivery in 2010, with an option for two more ships of the same design. The new ferries will be amongst the largest in the world, to be operated on Stena's North Sea route from Hoek van Holland to Harwich. The existing ships from the North Sea were to be moved to the Kiel–Gothenborg route, whereas the ships from Kiel would transfer to the Gdynia to Karlskrona route. The new ferries were launched in 2010, with Stena Hollandica entering service on 16 May 2010, and Stena Britannica planned to enter service in the autumn of 2010. The company also moved its Belfast Terminal from Albert Quay to the new VT4 during May 2008. This has reduced the length of the crossing to Stranraer by ten minutes. In July 2009, Stena Line announced that it had repurchased its former ship, Stena Parisien, from SeaFrance. The ship is now known as Stena Navigator. She had a comprehensive refit. Following on from this, the ship was introduced on the Stranraer to Belfast route, alongside HSS Stena Voyager and Stena Caledonia. In December 2010, Stena Line announced it had acquired the Northern Irish operations of DFDS Seaways. The sale includes the Belfast to Heysham & Birkenhead routes, two vessels from the Heysham route (Scotia Seaways & Hibernia Seaways) and two chartered vessels from the Birkenhead route (Mersey Seaways & Lagan Seaways). The Fleetwood to Larne route ended on 24 December 2010. On 26 February 2014 it was announced that Stena Line would acquire the Celtic Link ferry service from Rosslare to Cherbourg, France. On 21 November 2011, Stena Line introduced the Stena Superfast VII and Stena Superfast VIII to replace the Stena Navigator and Stena Caledonia. It was announced that the Stena Voyager would be removed from service on 20 November 2011. She was later sold to Stena Recycling and sent for scrapping in May 2013. Rotterdam – North Killingholme Haven: "Stena Scotia"
Stena has five vessels of the E-Flexer class on order, with the first scheduled for delivery in early 2020. ^ "Sessan Linjen" (in Swedish). Fakta om Fartyg. Archived from the original on 1 August 2012. Retrieved 21 September 2007. ^ "Lion Ferry" (in Swedish). Fakta om Fartyg. Archived from the original on 29 July 2012. Retrieved 21 September 2007. ^ "Stoomvaart Maatschappij Zeeland" (in Swedish). Fakta om Fartyg. Archived from the original on 31 July 2012. Retrieved 21 September 2007. ^ "Press release 9. 11. 2006". Aker Yards. Retrieved 21 September 2007. ^ "Stena Line announces major investment in innovative ferries". Stena Line press release. Retrieved 21 September 2007. ^ "DFDS sells Irish Sea ferry routes". DFDS A/S. Retrieved 3 December 2010. ^ "Stena Line buys Celtic Link ferry service". RTÉ News. 26 February 2014. Retrieved 27 February 2014. ^ "Stena Line – Our ships". Retrieved 12 August 2013. ^ "Stena's new formula for ro-pax market". The Motorship. 14 June 2018. Retrieved 16 September 2018. ^ "Stena Lifts Options for Two More E-Flexer Ships". World Maritime News. 18 July 2018. Retrieved 16 September 2018. Brogren, Klas; Bergenek, Anders; Sahlsten, Rickard (2012). Stena Line: the story of a ferry company. Göteborg: Stena Line. ISBN 9789186687236. Cowsill, Miles; Hendy, John; Haalmeijer, Frank (1993). Harwich-Hoek van Holland: 100 years of service / 100 jaar verdienst. Narberth, Pembrokeshire: Ferry Publications. ISBN 1871947154. Cowsill, Miles; Hendy, John (1996). Holyhead-Dun Laoghaire: from car ferry to HSS. Narberth, Pembrokeshire: Ferry Publications. OCLC 484331905. Cowsill, Miles; Hendy, John (1997). Stena Line: the fleet. Narberth, Pembrokeshire: Ferry Publications. ISBN 1871947448. Cowsill, Miles (2006). Fishguard-Rosslare: the official 1906-2006 anniversary book of Stena Line. Ramsey, Isle of Man: Ferry Publications. ISBN 1871947820. Cowsill, Miles (1998). Stranraer-Larne: the car-ferry era. Narberth, Pembrokeshire: Ferry Publications. ISBN 1871947405. Harvey, W.J. (1989). Stena Gothenburg 1939-1989. Göteborg: Stena AB. ISBN 9185786411. Harvey, W.J. (2006). Stena: a group fleet history. Windsor: World Ship Society. ISBN 0954331079. Haws, Duncan (1993). Britain's Railway Steamers: Western & Southern Companies + French & Stena. Merchant Fleets series, no. 24. Hereford: TCL Publications. ISBN 0946378215. Haws, Duncan (1993). Britain's Railway Steamers: Eastern & North Western Companies + Zeeland and Stena. Merchant Fleets series, no. 25. Hereford: TCL Publications. ISBN 0946378223. Haws, Duncan (1994). Britain's Railway Steamers: Scottish & Irish Companies + Stena and Macbrayne. Merchant Fleets series, no. 26. Hereford: TCL Publications. ISBN 0946378231. Hendy, John (1993). Ferries of Dover. Staplehurst, Kent: Ferry Publications. ISBN 0951350692. Hendy, John (1997). Ferry Port Dover: the development of cross-channel vehicle ferries, their services and allied infrastructure. Staplehurst, Kent: Ferry Publications. ISBN 1871947472. Merrigan, Justin P.; Collard, Ian H. (2010). Holyhead to Ireland: Stena and its Welsh heritage. Chalford, Gloucestershire: Amberley Publishing. ISBN 9781848689589. Peter, Bruce (2012). Stena Line: Celebrating 50 years of service. Ramsey, Isle of Man: Ferry Publications. ISBN 9781906608507. Sahlsten, Rickard; Söderberg, Bertil; Bång, Krister. Stena Line's Ships 1962-1992. Göteborg: Stena Line. OCLC 476605445. Widdows, Nick (2011). Stena Line: the fleet. Ramsey, Isle of Man: Ferry Publications. ISBN 9781906608415. 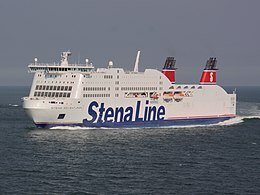 Wikimedia Commons has media related to Stena Line.